To update the ENFA method for use with large datasets and modern data formats. To expand the application of ENFA in the context of climate change in order to quantify different aspects of species vulnerability to climate change, and to facilitate quantitative comparisons of vulnerability between species. To correct a minor error in the ENFA method itself, that has persisted in the literature since Hirzel et al. first introduced ENFA in 2002. CENFA takes advantage of the raster and sp packages, allowing the user to conduct analyses directly with raster, shapefile, and point data, and to handle large datasets efficiently via partial data loading and parallelization. We will use some example datasets to perform a basic ENFA. The historical climate dataset climdat.hist is a RasterBrick of 10 climate variables, covering much of the western US coast. 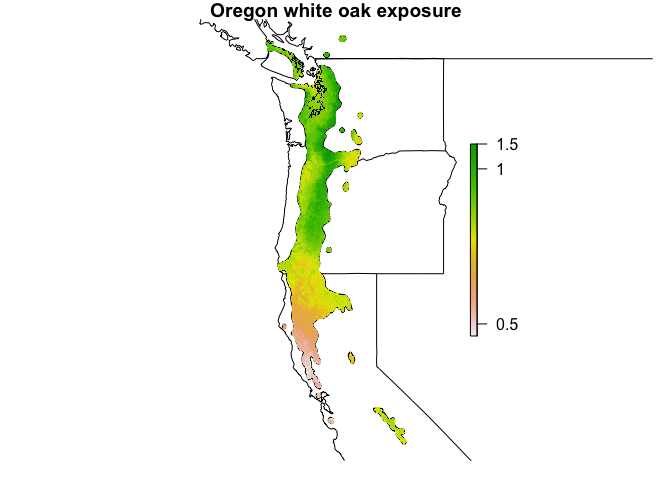 QUGA is a SpatialPolygonsDataFrame of the historical range map of Oregon white oak (Quercus garryana). The enfa function takes three basic arguments: the dataset of ecological variables (climdat.hist), the map of species presence (QUGA), and the values of QUGA that specify presence (in this case, a column named “CODE”). Calling the enfa object by name provides a standard summary of the ENFA results. For larger datasets, we can speed up the computation via parallelization. We provide two additional arguments, parallel = TRUE, and n, which specifies the number of cores to use. n has a default value of 1, so only setting parallel = TRUE will not parallelize the function by itself. The function will attempt to match the value provided to n with the number of cores detected on the local device via parallel::detectCores(); if the provided n is greater than the number of available cores k, a warning will be issued and n will be set to k - 1. The cnfa function is very similar to enfa, but performs a slightly different analysis. Whereas ENFA returns a specialization factor (the eigenvalues of specialization) describing the amount of specialization found in each ENFA factor, CNFA returns a sensitivity factor that reflects the amount of sensitivity found in each ecological variable. This makes the sensitivity factor more directly comparable to the marginality factor, and more interpretable in the context of species’ sensitivity to a given variable. Using the sensitivity_map function, we can create a habitat map that identifies where we expect the species to be most sensitivite to changes in climate. The departure function provides a measure of a species’ potential exposure to climate change. It takes a future climate dataset as an additional argument, and calculates the absolute differences between historical and future values. The departure factor tells us the average amount of change that is expected in each climate variable across the species’ range. Using the exposure_map function, we can create a habitat map that identifies where we expect the species to be most exposed to climate change. The vulnerability function provides a measure of a species’ potential vulnerability to climate change, taking both sensitivity and exposure into account. It takes a cnfa object and a departure object as its arguments. Using the vulnerability_map function, we can create a habitat map that identifies where we expect the species to be most vulnerable to climate change. The raster package contains the clusterR function, which enables parallelization methods for certain raster operations. clusterR only works on functions that operate on a cell-by-cell basis, however, which limits its usefulness. The CENFA package contains a few functions that speed up some basic raster functions considerably by parallelizing on a layer-by-layer basis rather than a cell-by-cell basis. The parScale function is identical to raster::scale, but has a parallelization option that will scale each raster layer in parallel. The center and scale arguments can be logical (TRUE or FALSE) or numeric vectors. The parCov function returns the covariance matrix of a Raster* object x, computing the covariance between each layer of x. This is similar to raster::layerStats(x, stat = 'cov'), but much faster when parallelization is employed. Additionally, parCov can accept two Raster* objects as arguments, similar to stats::cov(x, y). If two Raster* objects are supplied, then the covariance is calculated between the layers of x and the layers of y. The stretchPlot function provides a simple way to adjust the contrast of plots of RasterLayers to emphasize difference in values. It can perform histogram equalization and standard deviation stretching. I welcome contributions and suggestions for improving this package. Please do not hesitate to submit any issues you may encounter. Basille, Mathieu, et al. 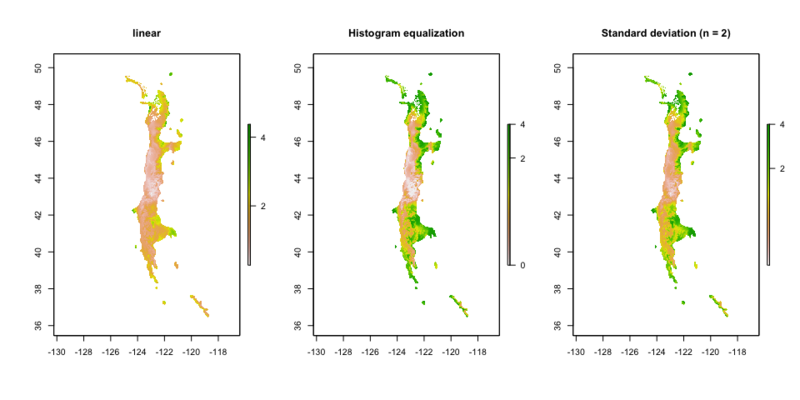 Assessing habitat selection using multivariate statistics: Some refinements of the ecological-niche factor analysis. 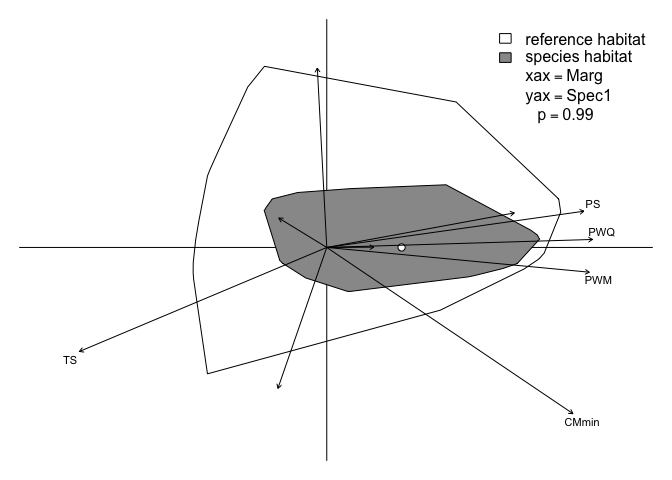 Ecological Modelling 211.1 (2008): 233-240. Hirzel, Alexandre H., et al. 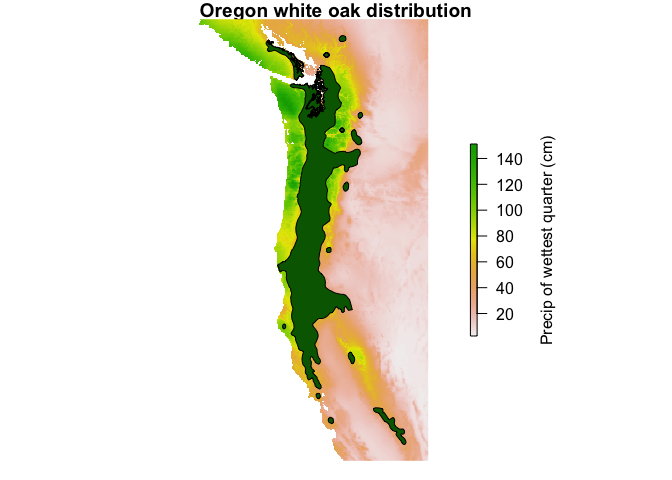 Ecological-niche factor analysis: how to compute habitat-suitability maps without absence data?. Ecology 83.7 (2002): 2027-2036. Changed quiet = TRUE arguments to progress = FALSE for more intuitive interface. Different definition of CNFA sensitivity factor and overall sensitivity, to better agree with ENFA specialization factor. Different definition of vulnerability factor and overall vulnerability. Fixed bugs in parScale function involving parallel methods. Added predict methods for enfa, cnfa, departure and vulnerability objects. Fixed bug in GLcenfa that prevented writing of Raster* objects. Imports raster package instead of depends. Published on CRAN, as of 2018/02/06!